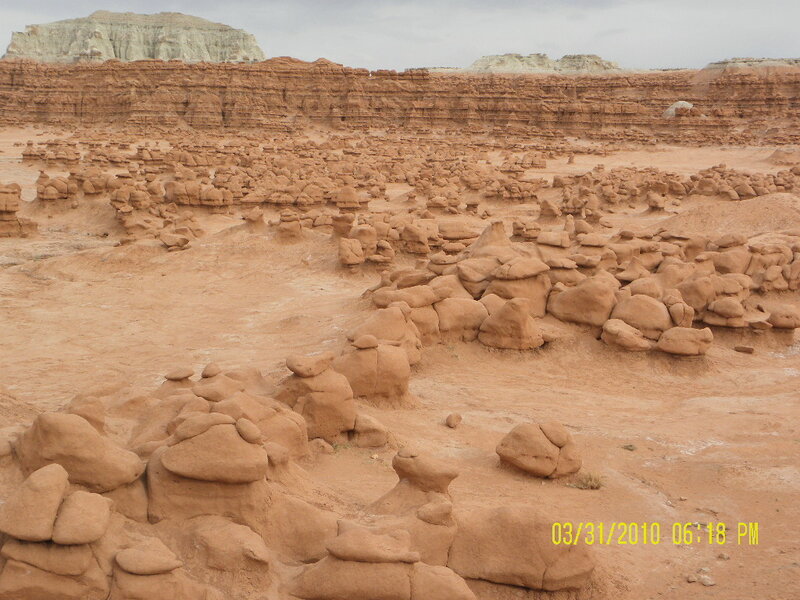 We continued on Hwy 24 until the little brown sign pointed to Goblin Valley. If we’d turned when the GPS told us to, we’d have taken a dirt road and we didn’t feel up to that. They’ve done some improvements to the campground since we were here 10 or so years ago. Each campsite now has a cover over the table. I don’t remember much of a restroom, before, but now there is a nice one with showers. There is an RV dump station and drinking water spigots throughout the campground. We paid $16 – no hookups. You can make reservations here. 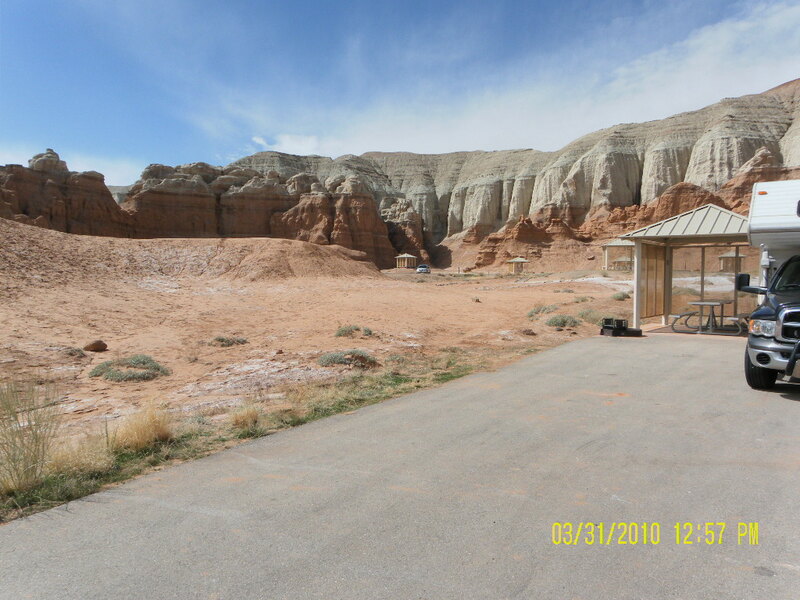 They have some tent-only sites and the RV sites have lots of pavement. We also saw quite a few campers and trailers, boondocking, on the property outside the State Park. 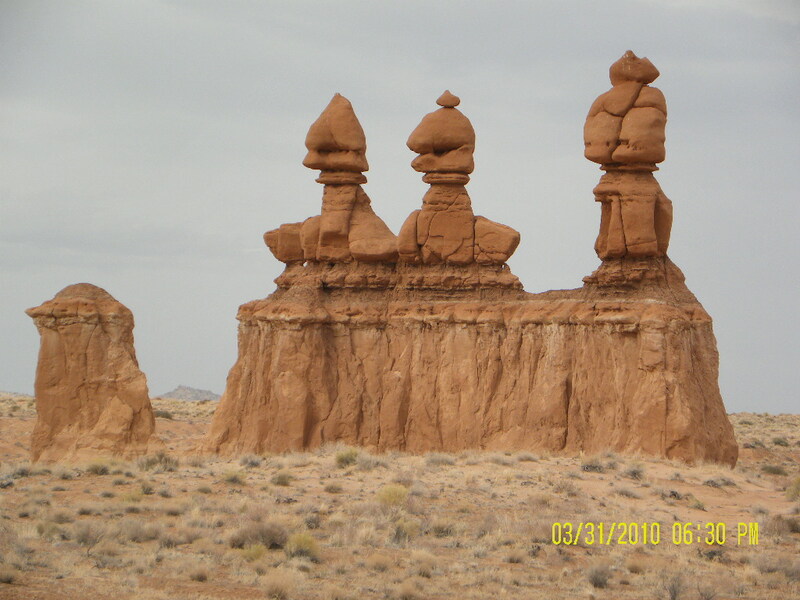 The unique rock formations are the reason people come here. We had beautiful blue skies but the icy wind was a little annoying. 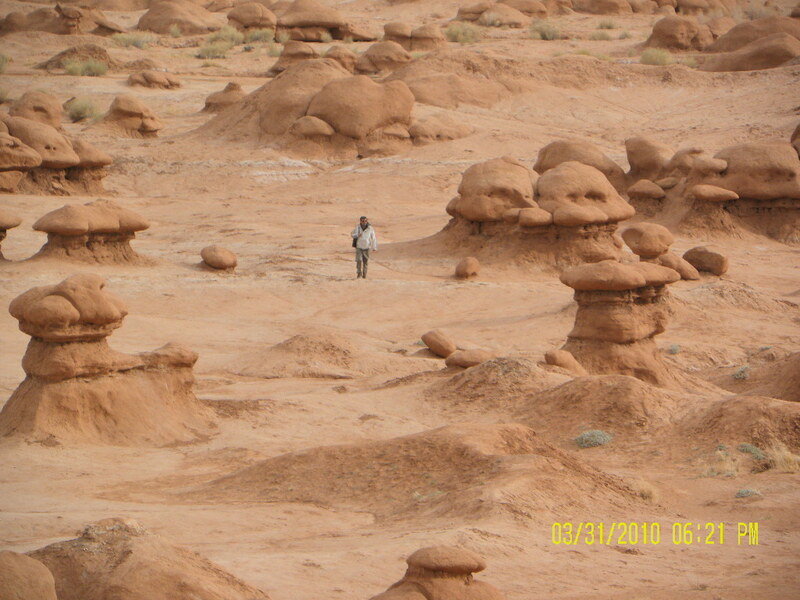 We don’t know this guy but it’s a good reference to see the size of the rock formations. We walked through here the last time we were here with our son and granddaughter. It’s amazing how quickly you can get lost. I was worried about loosing the kids! I think we left with them all? 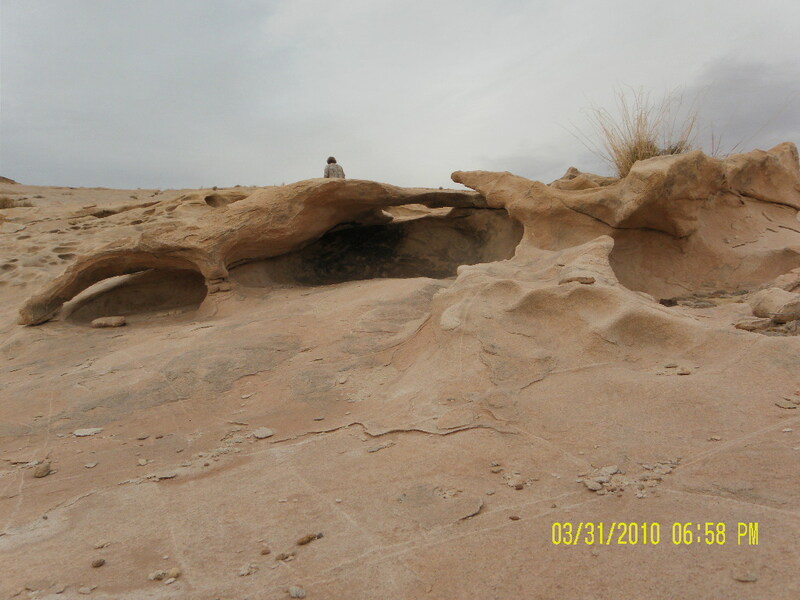 We walked around this area and admired the unusual mineral deposits and small rocks that have washed out of the layer of sand. I think the crystal is gypsum. 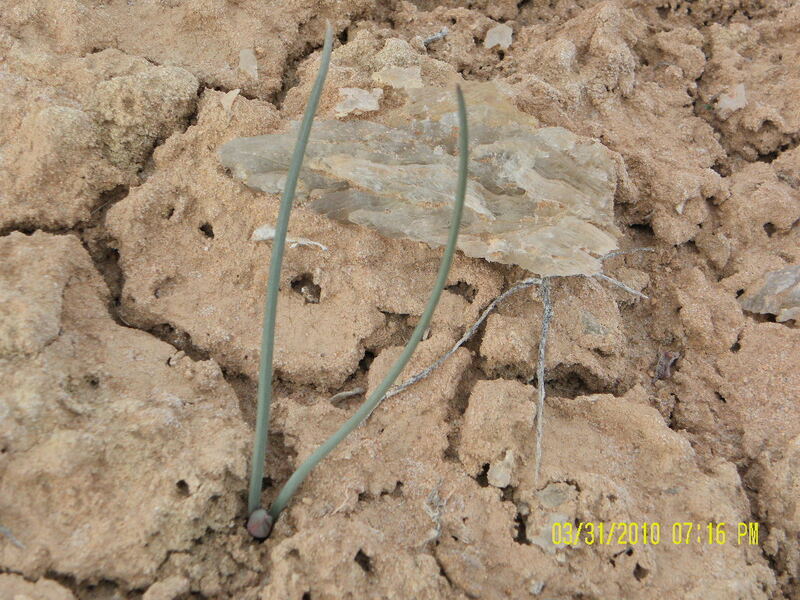 It’s amazing that anything can grow here! It was in the upper 40’s here today but felt colder because of the wind. I’m sure it got down into the 30’s over night. Winter is NOT over in Utah yet! But, Spring is kind of ‘bi-polar’ anyway.